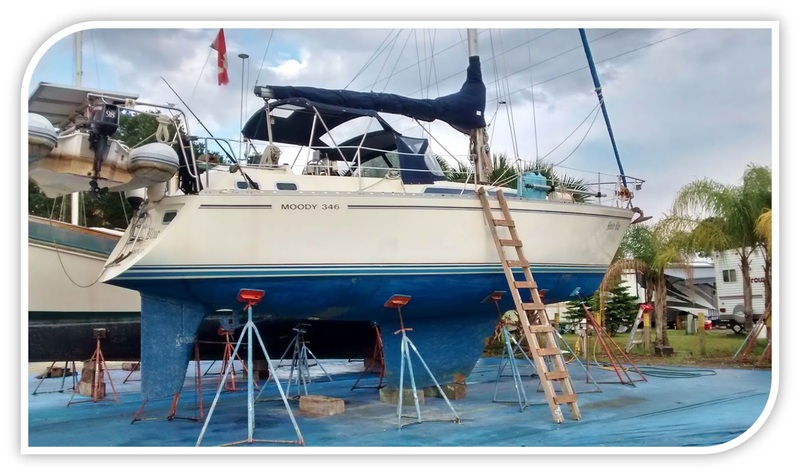 After buying our new-to-us sailboat, Tickety Boo, and taking her for a shakedown cruise in the Bahamas, we got the boat ready to lay up in a slip during hurricane season at Indiantown Marina in southern Florida. 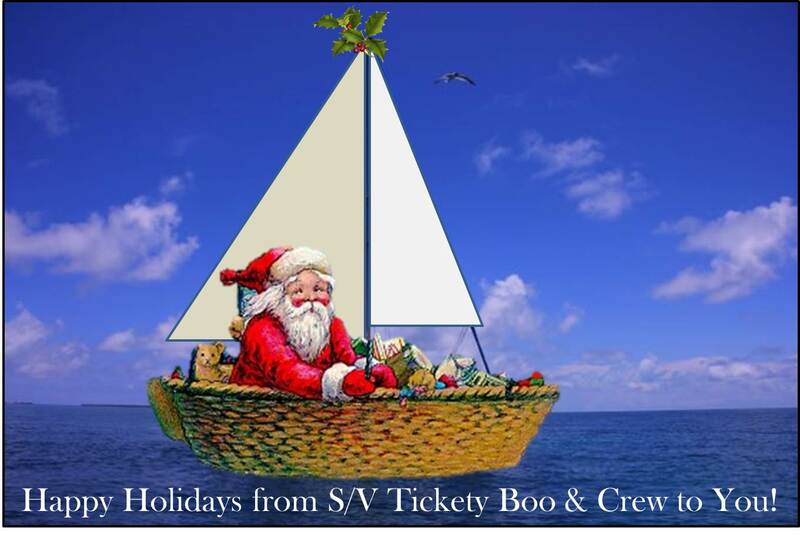 It was a requirement of our insurance to keep Tickety Boo in a hurricane hole until the end of November and Indiantown Marina ticked that box. 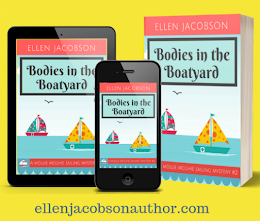 We took down the sails and stored them, stowed the anchors and tidied up other things that wouldn't be needed while Tickety Boo was tied to the dock. And then things got sad. Scott headed off across the water for work. At the beginning of July, Scott boarded a plane to Scotland for a few months to finish up a contract. Just in case you were thinking the life of an archaeologist is glamorous, it often isn't. In Scott's case, he's been busy day in and day out doing rather dull stuff like working on spreadsheets and archival records, drawing maps and writing reports - basically dealing with paperwork and bureaucracy. Add to that a computer that likes to act up from time to time and you can imagine how much fun he's been having. We're used to being apart for work for months at a time - it's been a way of life for us since we've been married. Scott's been off doing archaeology stuff, I've been traveling for my job around the States and overseas and we've lived in different countries with me working in New Zealand and Scott working in Scotland. To be honest, we don't really know anything different. In some ways, it's kind of like being in a military family. You are often apart, but that makes the times you're together even sweeter. Unfortunately, it looks like this stint Scott has in Scotland is going to take longer than either of us thought and his contract might get extended. But, that's okay, I've got Tickety Boo to keep me busy. My very long list of Very Important But Very Uninteresting Boat Projects kept me out of trouble. Not that I ticked many items off my very long to do list, but I did tackle some projects. Mostly indoor projects, because southern Florida during the summer is freakishly hot and humid. So hot and humid that one of the first things we bought when we got back from the Bahamas was an air conditioner from Walmart. It made all the difference in being able to cope with Indiantown during the summer. And it is still making a huge difference during this very unseasonably warm winter down here. I worked on inventorying everything on our boat (which was no small feat considering I didn't know what half the things were), putting together a ditch bag of emergency stuff if we ever have to abandon ship, deep cleaning the boat (using my favorite super hero - Captain Vinegar and his sidekick the Bleachinator), replaced a broken vent, researched and purchased various equipment, whipped up some sewing projects on our Sailrite sewing machine (slipcovers, throw pillows and other bits and bobs), took my Ham Radio test, as well as tackled a host of other tasks too dull to mention. And then things got exciting - stuff started breaking! 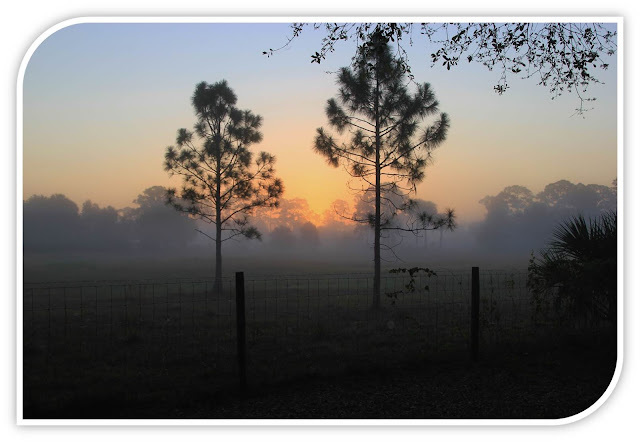 Indiantown during the summer has some great attributes - it's quiet and peaceful. Hardly anyone was here so the free WiFi was plentiful, no one hogged the grill or the TV remote and I never had to wait around to use the shower. With the exception of a few guys who have been liveaboards here for years, it was pretty much just me and Matt and Jessica from MJ Sailing here during the summer. Of course, not that I would have noticed if anyone else showed up because it was too hot and humid to ever leave the air conditioned confines of Tickety Boo. In general, I'm quite content and happy on my own, but things were getting even a little dull for me at the marina. So, I was almost excited when the wall in our head/bathroom started developing a crack in it. A mystery to solve! Something to ask people on Facebook about! Fun pulling everything out of the lazarette to check what was happening on the other side of the wall! Wait, that last part wasn't fun. That's a pain in the you know what, especially dragging our 40 lb Rocna anchor in and out of the lazarette. I never did figure out what caused the crack, and it has now stopped growing. But, I did figure out where I'm going to hide the dead bodies on our boat. See, even when bad stuff happens, like mysterious cracks in your boat, something good comes out of it. Of course, I had to fix our toilet too and it smelled pretty bad. I'm still trying to figure out the good part of that particular little project. I'm sure it's there. I just haven't looked hard enough. I headed off to Portland to visit family during the height of hurricane season. I remember when I was getting ready to leave, one of the long term liveaboards looked at me in surprise and said, "But, you know this is the time of year when the hurricanes are likely to strike, right?" Yep, those are the kind of reassuring words you want to hear when you know you're leaving your boat all alone. Not just your boat, but your floating home. Despite the fact that Indiantown is a hurricane hole, hurricanes have struck here before and there had been a hurricane scare earlier in the summer with Erika's cone of destruction threatening to hit southern Florida. But, I shrugged my shoulders, left a key with Matt and Jessica and headed off to the Pacific Northwest for a couple of weeks. Good call - no hurricane and lots of fun with family. Turns out Nancy Drew has a vacation home in Indiantown. Which is a good thing, because when Tickety Boo developed a mysterious leak and the bilge pump went off for hours one day, I was able to enlist her help in solving the Case of the Slowly Sinking Ship. Or, at least I thought so. Unfortunately, it turns out Nancy is a bit of a slacker and has never really gotten to the bottom of the mysterious leak or been able to recreate that particular situation. While the Case of the Mysterious Crack kept me occupied during the summer, I really didn't need the drama of the mysterious leak in November. By this time, people had returned to Indiantown! New friends and old friends, with plenty of socializing to distract me from my list of Very Important But Very Boring Boat Projects! Leaks, no thank you - you're not invited to the party. They showed up anyways, very rude of them I think, and took up way too much of my time for a few weeks. 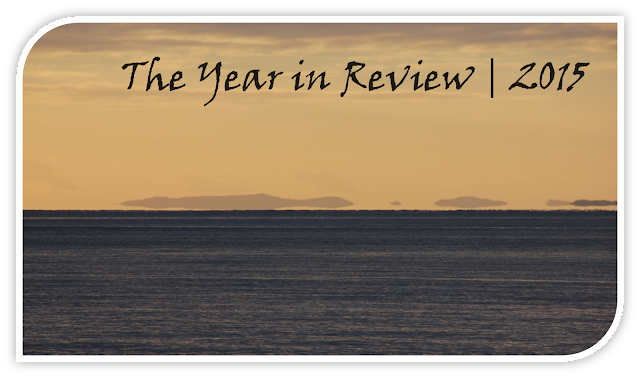 The year draws to a close and the water is wide. Wow, soon it will be 2016. Amazing to think that another twelve months has gone by and that so much has happened in our lives. One of my favorite sayings is, "Take the good with the bad." When I think back on 2015, sure some bad has happened, but there has been so much good that it makes you forget about the bad. Except, maybe for that mysterious leak. The water continues to be wide with Scott on one side of the Atlantic and me on the other. But, you take the good with the bad. He's doing what he needs to there, I'm doing what I need to here and before you know it, he'll be back and we'll get this boat off the dock again. Are you familiar with the song The Water is Wide? It's a Scottish or Irish folk song, depending upon who you ask, and it's one of my favorites. I particularly like this version by the French Canadian folk singer, Lucie Blue Tremblay. It seems like an appropriate song to wind the year down for us. Who knows, maybe you'll like it too. It's that time of year. A time to reflect on the year past and a time to look forward to what surprises the Universe has in store for us in the coming year. During the beginning of the year, we traveled from Texas to the Gulf Coast of Florida in our tiny Scamp travel trailer in search of a new sailboat (check out Part 1 of our Year in Review here.) 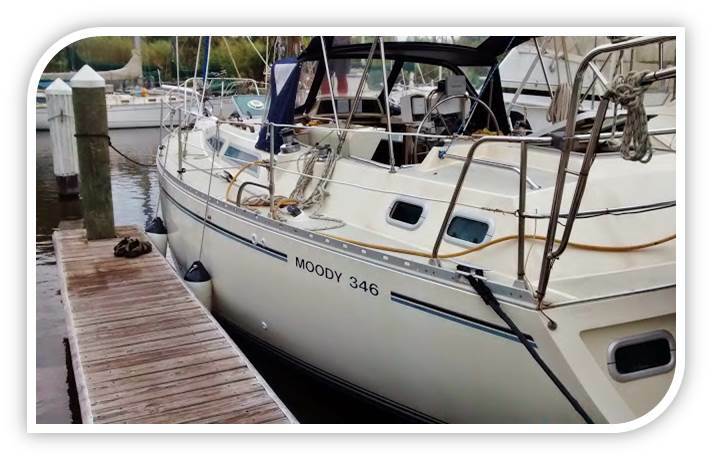 After months of constant checking of sailboat listings and not finding the right one for us, we got a lead on a Moody 346 for sale. At last - things were looking up! Only one problem - the boat was in the Bahamas. Scamper is a great little travel trailer and she can go most places, but she still hasn't mastered the art of crossing large bodies of water without sinking. We emailed the owners, told them we were interested, asked some questions about the boat and the specs and made arrangements to see the boat once they got back to Florida. 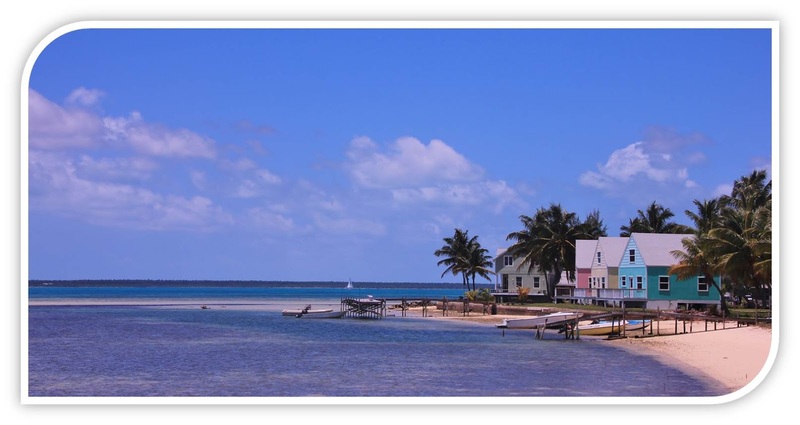 While we were waiting, we managed to score a last minute cancellation at the Jolly Rodgr RV Travel Park in Marathon and we headed on down to the Florida Keys. Scott had been to the Keys in his younger days and had some great stories to tell, so I was curious to see what all the fuss was about. 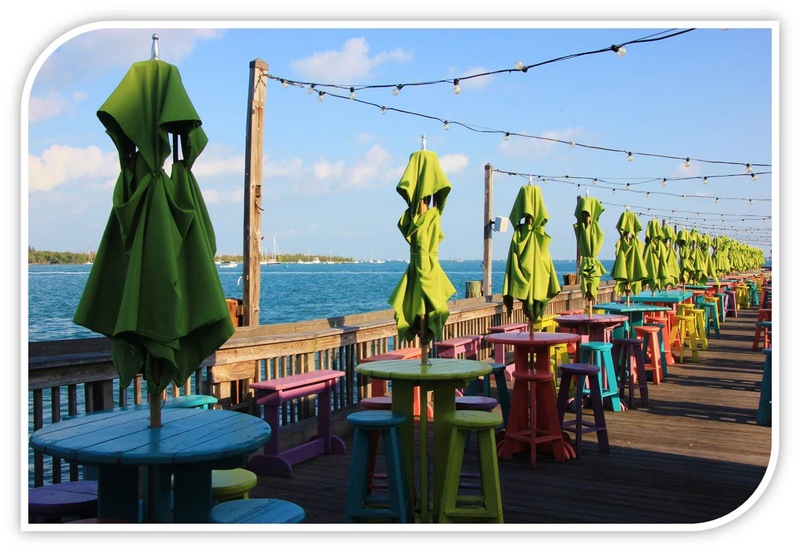 We did the usual tourist things, like head out to Key West, walk the Seven Mile Bridge, enjoy the peace and quiet at the Key West Garden Club and go for strolls on the beach. We headed up north towards Stuart to view the sailboat. The owners were planning on crossing from the Bahamas to Stuart in the middle of February and we made arrangements to camp at the nearby Jonathan Dickinson State Park while we waited for them. We waited and waited and waited. Unfortunately, they had a problem with bad fuel which caused them to cancel their crossing and then they waited for the next weather window. The snowbirds are in full force in Florida during the winter and it was pretty much impossible to find a place to stay near Stuart on the coast while we waited for them to try cross again. So, we headed inland towards Lake Okeechobee - the land of sugar cane fields and cowboys. We managed to score a place at the South Bay RV Campground in Belle Glade, where we waited and waited and waited. Then, we found free camping at a place nearby. Where we waited, looked at some other boats, and waited some more. Finally, they were able to cross and we got our first look at what would become Tickety Boo. She looked promising, but there were a few things we wanted to check out and think through, so the owners suggested we come out for another visit the following week. We emailed to make arrangements, but didn't hear anything for a few days. Then we got an email saying they had an issue they had to resolve. 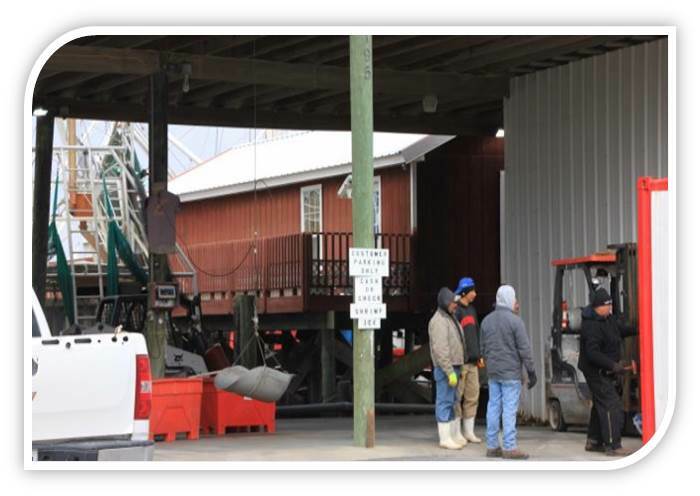 We didn't know what the issue was or what the timeframes were to resolve it, but as we were interested in the boat, we hung around the area waiting to hear back from them. After a while, not hearing anything back, we gave up waiting and headed back down to the Florida Keys and Everglades National Park. This time, we managed to score a last minute cancellation at one of the State Parks in the Keys - Curry Hammock. 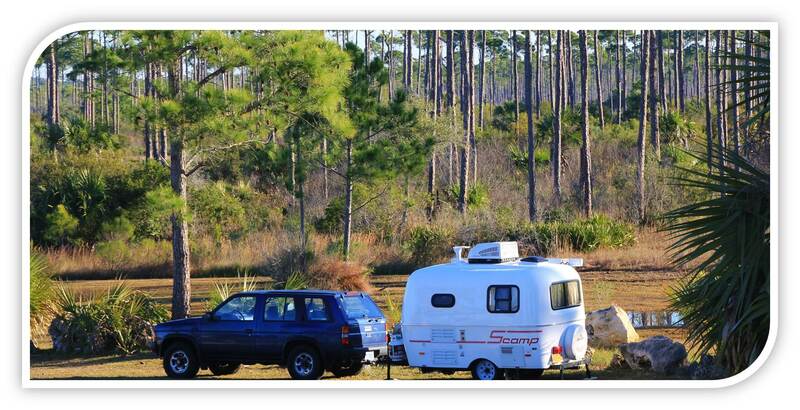 After a few days there, we went and camped at the infamous Flamingo Campground in the Everglades. We quickly found out why it was so infamous - the amount of mosquitoes and noseeums was beyond anything we had ever experienced before. But, it was worth it and we saw some amazing wildlife, the historic Nike missile site and went on some great ranger-led programs. Turns out they had engine problems. 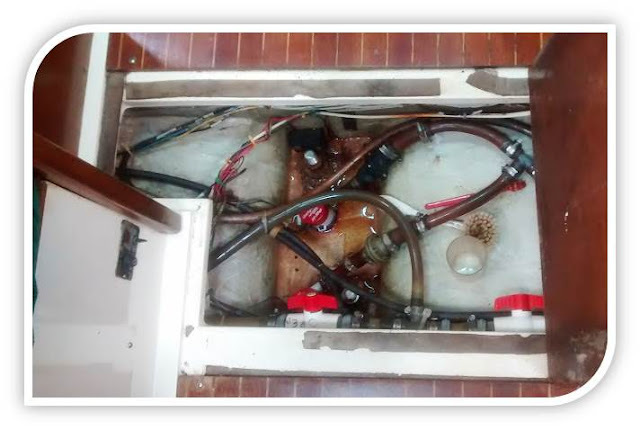 After a while, the owners emailed us to let us know that the issue they had was with their rebuilt injector pump, which needed to be addressed and meant that the boat couldn't be moved. They had had the work done by Indiantown Marina the previous fall and were waiting for them to organize to send someone out to fix the problem. So we waited and they waited and towards the end of March we were able to go out and see the boat again and check out the engine repairs. Eventually, after some to-ing and fro-ing, trying to find a surveyor and a place to haul-out the boat for inspection, working through all of the paperwork and taking care of all the other bits and bobs involved in buying a boat, everything came together and Tickety Boo became ours in the middle of April. (You can find more info about our Moody 346 and specs here). We got Tickety Boo ship-shape and ready to go cruising at Indiantown Marina. We headed to the Bahamas to shake Tickety Boo down. Three weeks after buying Tickety Boo, we headed across the Gulf Stream to the Abacos for a month on a shakedown cruise to get to know our new boat. After being without a sailboat for almost a year (we had sold our previous boat in New Zealand), it was so much fun to be out there on the water again. And even more fun to be in the Bahamas. We had an easy crossing, we had decent weather, we hooked up with an awesome buddy boat, we ate lots of coconut bread, we saw gorgeous sunsets, we snorkeled, we swam and we enjoyed meeting the super friendly Bahamian people. We couldn't have asked for a better shakedown cruise. If you want to read more about what we got up to in the Bahamas, you can find links to all of our posts here and you can find out how much our shakedown cruise cost here. But, then, like all good things must, it came to an end. In mid-June, we made our way back to Indiantown Marina in southern Florida to lay the boat up in the water during hurricane season. Next up on the Year in Review, we'll tell you how the rest of the year went. 2015 was a big year for us. I tried to find a better word to describe the past year other than big - like colossal, massive, tremendous or monstrous - but sometimes simple words and phrases work best. It was big. Simple as that. We had big adventures traveling across the States, we made big purchases (both our sailboat and stuff for her), we had big fun sailing our new boat and we created big memories. We started off the year scampering in Texas. The latter part of 2014 was hard for us when we lost Scott's father. 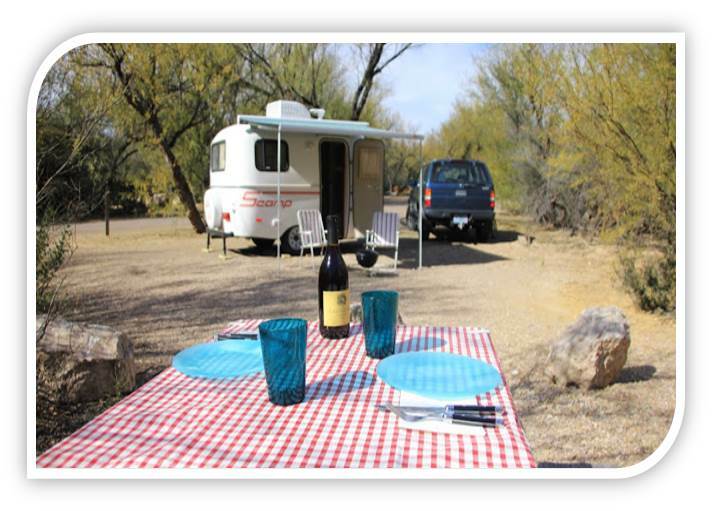 So, the beginning of 2015 was a perfect antidote - lots of time together making our way from Texas to Florida in Scamper, our tiny house on wheels. Adventure and travel - the great way for us to start the year. We were hangover-free on New Year's Day. Hard to believe, but true. We rang in the New Year in southeastern Texas, near Kemah on the Galveston Bay. Well, to be honest, we really didn't ring in the New Year as much as sleep through it. We're those early to bed and early to rise kind of people and generally find New Year's Eve to be a bit of an overrated holiday. Yes, we're those boring middle-aged people who prefer sleep to loud parties, followed by hangovers the next morning. 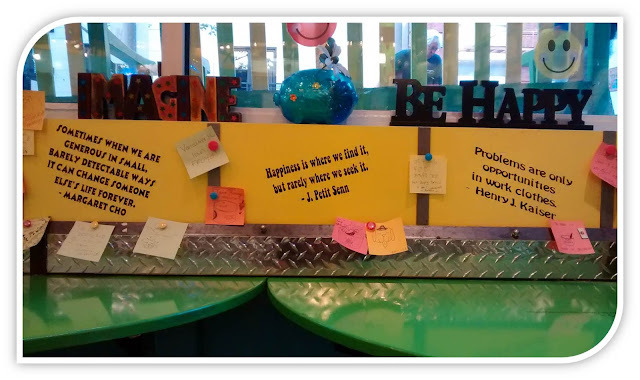 You can read about our time in the Kemah-Galveston area here and here. We can't stop talking about the shrimp in Louisiana. Do you ever have meals that you keep reliving over and over and over again? Honestly, we probably talk a little too much about the shrimp we got at Dean's in Grand Isle, fresh off the boat that morning. "Do you remember that amazing shrimp we got when we were at Grand Isle State Park?" "Yes! You made the best spicy shrimp pasta with it." "Even better, it was only $4 a pound!" Then we start drooling and daydreaming about finding shrimp that delicious and at that incredibly low price point again someday. You can read more about it here. We made a detour to New Orleans in search of beignets. 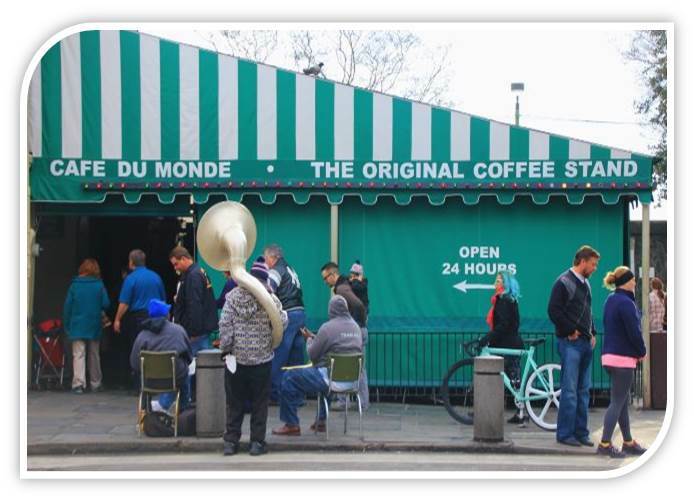 Have you ever had a beignet? I love them. You would too. Fried dough sprinkled with heaps of powdered sugar. What could be better? There was no way we were going to leave Louisiana without scoring some beignets in the Big Easy. In an effort to save money, we stayed in a really dodgy RV park and took the bus into the city each day. Which was smart, because then we had more money for beignets. You can read more about our adventures in New Orleans here and here. After gaining at least five pounds each eating beignets in New Orleans, we made our way to the Florida panhandle via Mississippi. 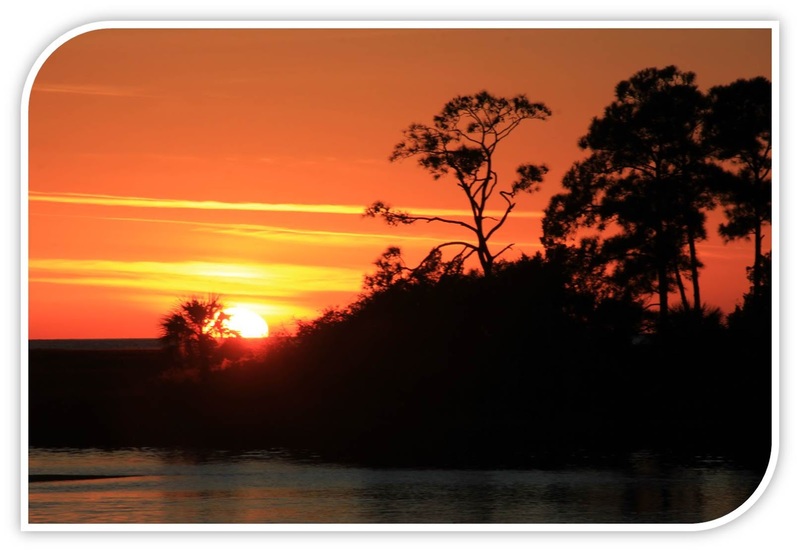 Our plan was to drive down the Gulf Coast of Florida and then up around the East Coast in search of a sailboat and warmer weather. While finding warmer weather was a bit elusive in January and February, we did get a chance to see some of amazing diversity that the Sunshine State has to offer. I asked Scott what his favorite memory of our time on the Gulf Coast was and he said spending time with my wife. Isn't that sweet? 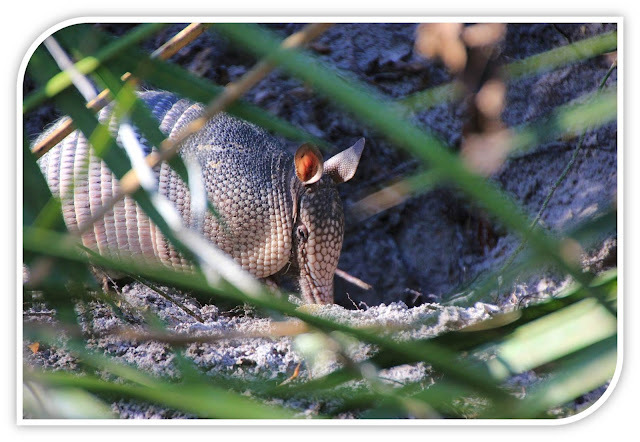 We saw armadillos, creepy vultures and UFOs! We also camped at some wonderful county, state and national parks and forests including the Gulf Islands National Seashore (where we had wonderful walks on the beach), Pine Log State Forest, Manatee Springs State Park (where I saw my first real live armadillo, plus a lot of creepy vultures), Ochlocknoee River State Park (where we got drenched in torrential flash floods), Shell Mound County Campground (where we had a UFO sighting), Myakka State Park (where I got overly excited about the strong WiFi signal) and Collier-Seminole State Park (where we stalked fellow Scampers and went canoeing). We also spent a couple of nights at the very quirky Linger Lodge where road kill is on offer at the restaurant (we settled for just beer). In mid-February, we got a lead on a sailboat that looked promising. 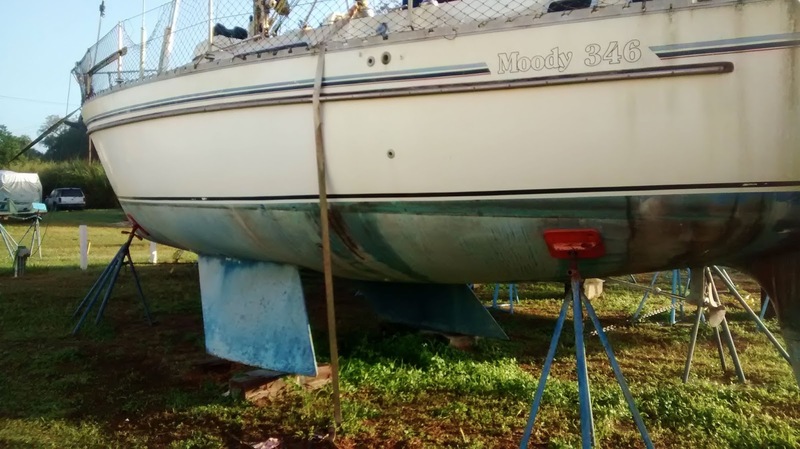 After months of daily checking of sailboat listings and not really finding anything suitable, we found a boat for sale that looked like it might tick most of our boxes (you can see our boat wish list posts on this page). 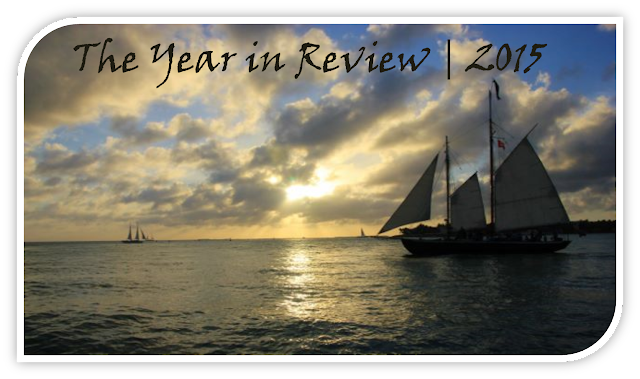 Next up on The Year in Review, we'll tell you about our adventures making our way down around the tip of Florida and up the East Coast of in search of Tickety Boo and the twists and turns that followed. In the past, I would (usually) have two to three weeks of blog posts written and scheduled to publish. I would have a list of ideas for blog posts written up and know exactly what I was going to write about for the next month or so. My mother would be proud of how much structure and order there was going on around here. Lately, things have been a bit more haphazard. Now, posts are written the night before, or, more often than not, on the day I post them. I wait until inspiration strikes and then I'm off. In reality, it's really the crazy little voices in my head that tell me what to write, but I prefer using the term inspiration to describe the process. It sounds a bit more posh. Plus, if you tell someone the voices in your head told you to write something, they might wonder if you need to up your medication. But, if you tell them you were inspired to write something, then they nod in an understanding way. This morning when I spoke to Scott, he asked me what I was going to post on the blog today (we usually post every Monday, Wednesday and Friday). I said I didn't have a clue, that I was waiting to be inspired. So, I went about my business here today - going for a walk with my friend Jane, doing laundry and chatting with people about the big news here in Indiantown. Yes, at last, Dunkin' Donuts has opened. People are very excited. I think there may even be a parade down the main street later this week. This is the biggest thing that's happened here since the McDonalds opened a couple of years ago. The little voices in my head weren't all that interested in any of that. 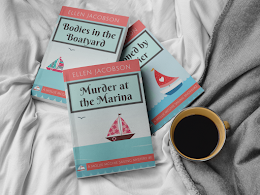 However, their little ears perked up when I was talking with some folks and one of them mentioned that a woman on a sailboat that just arrived at the marina last week was a writer. A real live writer. With published books and articles and everything. The real deal. As were were talking to ourselves, one of the little voices in my head said to me, "But you're a writer too." And then one of the other voices in my head said, "Nah, you're a blogger. Totally different thing." And then a third voice cautioned (I've lost count of how many voices there are in my head, by the way), "Don't say anything about the fact that you have a blog. If they ever take a look at it, they'll think you're a total nut job. And not just because we keep talking to you in your head. You write some weird stuff." I kept my mouth shut and then we started talking about Dunkin' Donuts and the fact that I cut my own hair last week They gasped in horror when I told them that. The ladies, that is, not the voices in my head. After all, they're the ones who told me to go ahead and cut it. They always seem so convincing when they're talking to me. Remember how they convinced me to buy that psychedelic kiwi fruit fabric for my throw pillows? Later, I realized I'm actually glad most people here at the marina don't know about this blog. This is a good thing about not having a lot of blog followers. 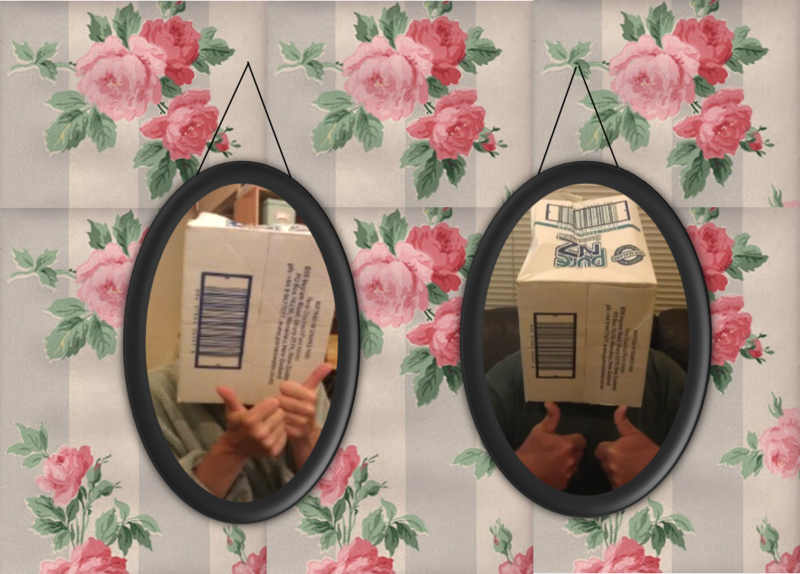 It's kind of nice to have a secret, anonymous life as a blogger. I'd probably feel weird if I knew everyone around here was reading my blog. Of course, they'd probably feel weird too because they'd know I have little voices in my head telling me what to do. Just in case anyone here accidentally stumbles across this blog, I'm glad we generally don't have pictures of ourselves on here. That way, they'll never know it was me. They'll be so busy looking for someone with a box on her head, I'll just slip on by. Anyway, that was today's random stream of consciousness, brought to you courtesy of the little voices in my head. I bet you can't wait to see what they have to say on Wednesday. Maybe, I'll have made a trip to Dunkin' Donuts by then. Thanks for stopping by our blog - we love it when people come to visit! 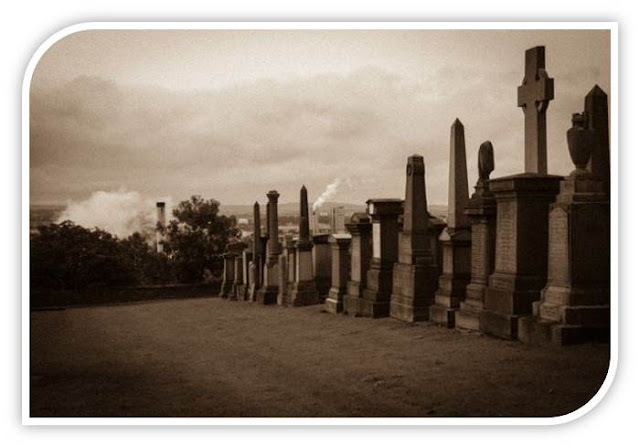 We're also on Facebook - we'd love for you to pop by and say hi! One of the more expensive things we bought for our new boat was a Sailrite sewing machine. It cost us over $700 to drink the Koolaid and join the Sailrite cult. 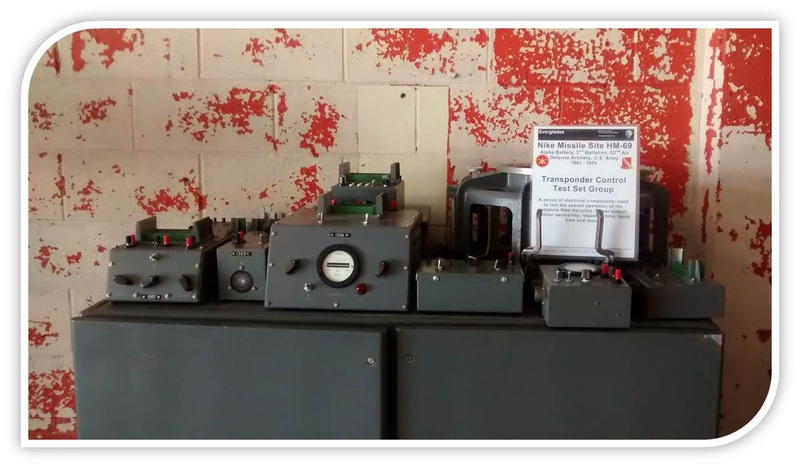 (You can read more about the decision process and other machines we considered here.) In exchange, we got a shiny, blue hunk of metal which promised to transform our boat into a fabric covered wonderland. Considering how much we spent on our Sailrite back in August, I've been trying to put it to good use and recoup some of the cost. I've written posts on the Spartan green slipcovers I made for the settees in our saloon and the crazy kiwi and fishy throw pillows I stiched up. But, there are also some other projects I've magicked up over the past several months, which I thought I'd document here on the blog so that: (a) I keep track of what I've done; (b) you don't think I've been a total slacker when it comes to boat projects since Scott's been gone; and (c) the folks at Sailrite see this post and, after one too many rum-laced eggnogs, think I'm such a fabulous seamstress that they offer me a lifetime 75% discount on everything they sell. If you're into sewing projects, have a look below. If you're not, and I totally get it, then turn off the computer, pour yourself your own rum-laced eggnog, put some holiday music on and spend some time with your loved ones. We don't have a ton of good storage space on our boat for clothes. 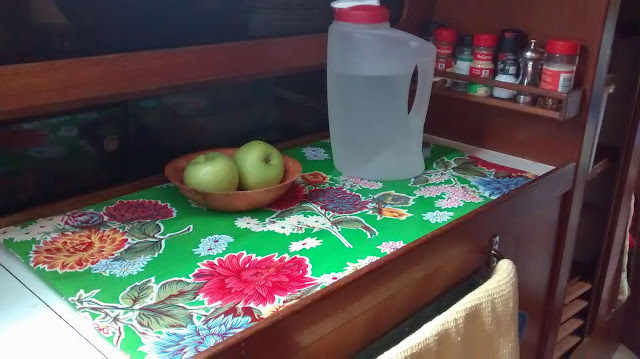 One of these days, I'd like Scott to put some shelves in the hanging locker in our aft cabin (which we use as our bedroom) so that we can stack folded clothes in there. Right now, it's set up for hanging up clothes, but since I don't have a proper job these days, I don't have too many clothes that need to be hung up. Since we started traveling around by tiny camper and boat, I don't have the most glamorous of wardrobes. There isn't even an iron on our boat - that will give you a sense of how little of a fashionista I am. Because I don't have a good place to store my folded t-shirts, shorts and tank tops, I've been piling them up on the settees in our aft cabin. 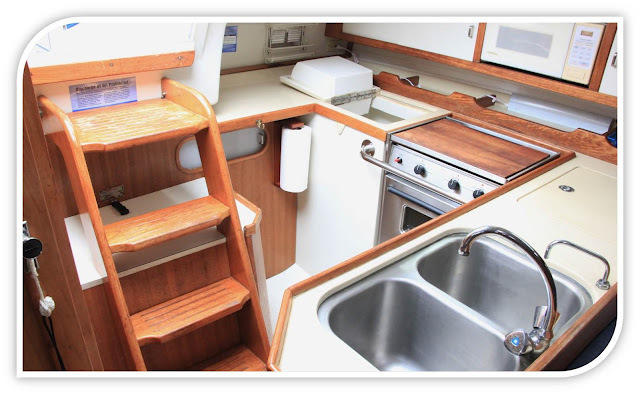 It looks awful - an untidy mess of clothes just waiting to tumble all over the place when the boat moves. So, I had this idea to sew up some sort of cute storage container which I could put my clothes in, hide them from view and tidy the place up. I thought about creating something like those packing cubes you see which people use to organize their clothes in their luggage. What I ended up with wasn't quite like what I pictured in my head. But, isn't that always the way. In my head, I have frizz-free hair which is thick and luxurious. In reality, not so much. 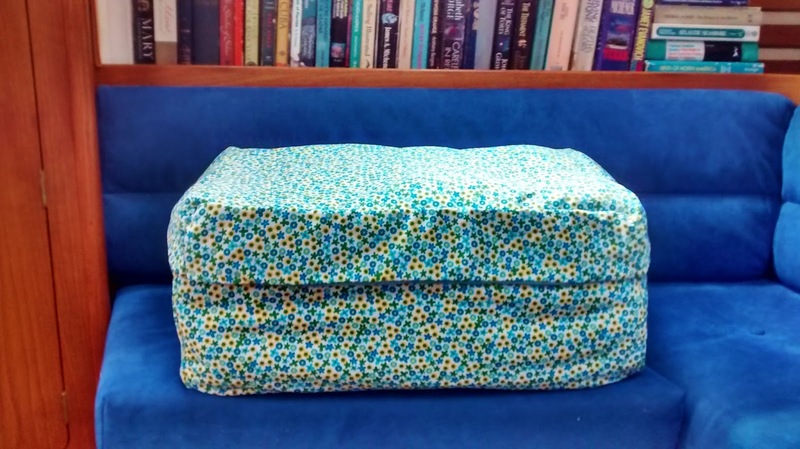 I basically ended up with a rectangular box made out of a floral print I got on sale and lined with some blue duck cloth. I made a bottom panel, four side panels and stitched the whole thing together. Using the same principle, I made a lid which I attached to the box at the back so that it folds back. I'm planning on adding velcro on the sides of the lid and box to keep it closed securely. I don't like that it turned out so floppy. It's okay when it's full of clothes, which helps give it structure. But when it's empty or partially filled, it flops down all over the place. Ick. I'm thinking of opening up the side panels and adding some sort of plastic inserts at some point to give it some structure. But, in the meantime, things look a teeny bit tidier on Tickety Boo. Just don't look in the v-berth. That will scare even the least organized person among you. The previous owners had a foam mat which they placed on top of the fridge. 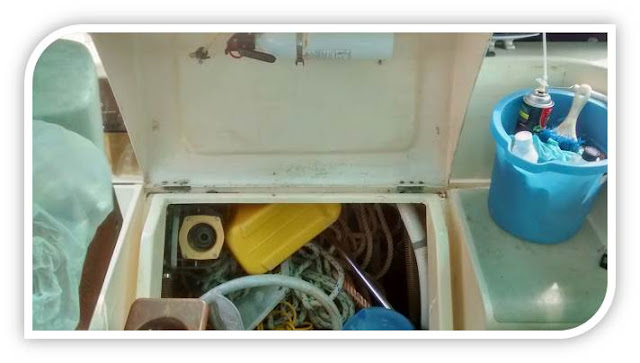 For those of you not familiar with typical fridges on boat, you might not realize that they often open up from the top. It's a crazy system - you open up the fridge, lean over and poke around everything trying to find that last bell pepper that you know is in there somewhere. Usually, all you find is a can of beer you forgot about, wilted celery and some mysterious oozing liquid from something that spilled. The key is to drink the beer quickly and forget about the mystery ooze. Save that problem for another day. Having some sort of insulation on top of your fridge is a great idea - it keeps the coldness in and saves on energy required to keep the fridge at the right temperature to provide perfectly chilled beer. The original foam mat was utilitarian, but boring. We don't do boring on Tickety Boo. And why should we, when we have a trusty Sailrite sewing machine that can transform our lives. Or at least, transform a foam met. I made a simple cover for the foam mat out of some colorful oilcloth, slid the mat in, sewed up the edge and admired it while sipping on my beer. A very simple project which brightens up the galley. The previous owner had sewn some nautically themed curtains for the head (aka bathroom). They're perfectly fine, but not my cup of tea. So, I whipped up some new ones using this weird tangerine swirl fabric. I really shouldn't be allowed to look at fabric online with a credit card handy. Another simple project. Basically, each curtain consisted of a panel of weird tangerine swirl lined with plain white broadcloth. 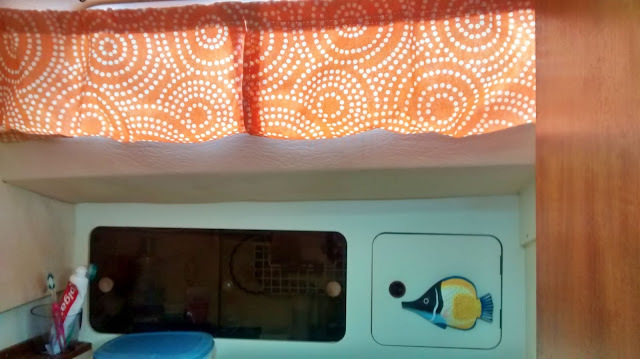 I hemmed up the top and bottom so that fishing line could be inserted all the way around both curtains and tied onto hooks on the window. I didn't quite get it tight enough at the top so it droops a little bit. Something to add to the list of fix this one of these days projects. Using fishing line is a great idea because it is almost invisible. I can't take credit for that - I just copied what the previous owner did. 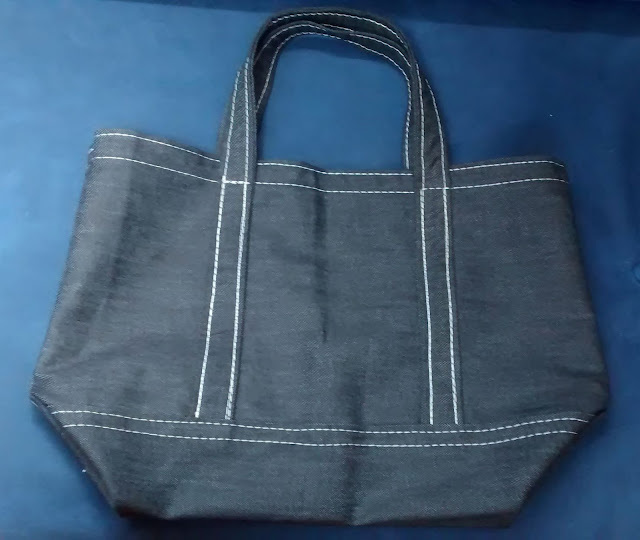 This market tote bag was the very first project I made on our Sailrite. 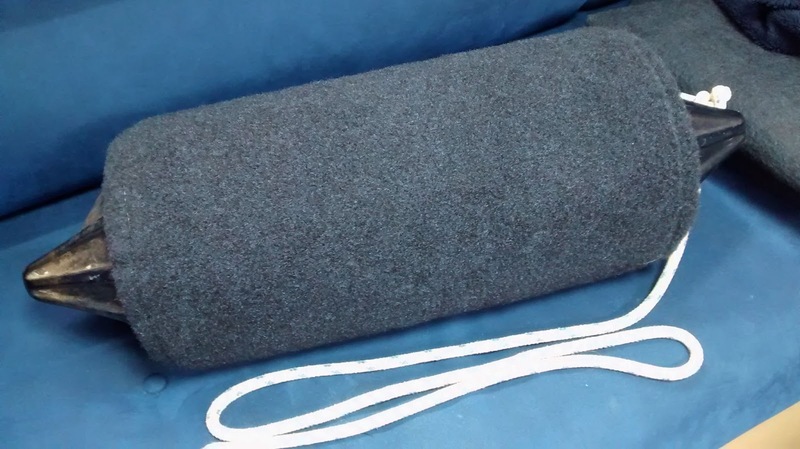 I used to do some home sewing many, many years back, but I was really out of practice when we got our Sailrite. So, I picked a project from the wonderful tutorial videos that Sailrite has on their website, grabbed a cheap remnant at Walmart, watched the video a million times and went at it. It's actually a good first project to practice on. I got to monkey around with trying to make straight seams (not always easy! ), used seamstick tape to baste my seams before sewing, zig-zagged my raw edges to keep them from fraying and sewed through multiple layers of materials. While it doesn't look like the most professional of bags, it was a good learning experience, was inexpensive to make and its functional. 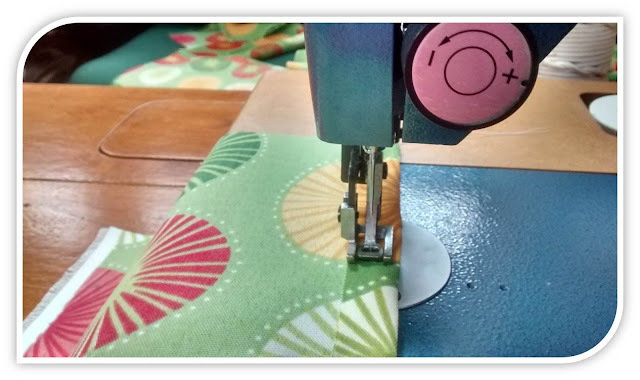 Next up on my sewing project list is a new cover for our Magma grill, another clothes storage box, hatch covers, a duvet cover and repairs to our bimini and dodger. I'm also thinking of making some pencil bags and the like out of the scrap material I have left over. Are you a sewer? What kind of things have you been magicking up lately? The first time it happened I had been sleeping in the saloon. This was during the period of Nancy Drew's investigations of the Case of the Slowly Sinking Ship and I wanted to be able to hear the bilge pump if it went off again, something I can't really hear back in the aft cabin. By the way, for those of you who were wondering, Nancy Drew is actually a real slacker. I know we all thought she was a crack sleuth, able to solve any mystery quickly and decisively, all without getting a hair out of place or spilling anything on her angora sweater set. Turns out she's nothing like what you think. Talk about having a great PR team. They make sure photos of Nancy in stained sweat pants eating potato chips, drinking cheap beer from a can and lounging in front of the telly never make it into the magazines. But, that's how she spends most of her days. Nancy hasn't been able to put the remote down long enough to figure out what the heck happened on that day of the mysterious leak. I think I'm going to have to call in the Hardy Boys soon. They seem like responsible young lads. Okay, enough of that, let's get back to the issue at hand. When the annoying BEEP! BEEP! BEEP! first went off, I thought to myself, "What the heck's with the beeping sound. Just what I need, another problem to worry about. Where's Nancy when you need her." Then I checked the bilge. Dry as a piece of melba toast. And the beeping stopped. So I promptly forgot about it. Then it happened the next night. I was still sleeping in the saloon just in case the leak came back. By the time I untangled myself from my blanket to investigate it stopped. Checked the bilge. Dry like beef jerky left in a hot car all day. The third night I didn't hear anything, but I did have a strange dream about aliens invading Earth and using some sort of ray guns which made a strange beeping noise. After a few nights, I moved back into the aft cabin. Occasionally, I would hear beeping. Always at midnight and always for one minute. It was perplexing. I called Nancy to see if she had any idea what was going on, but her phone went straight to voice mail. I'm pretty sure she was watching a Keeping up with the Kardashians marathon on the telly. Honestly, that girl. Such a slacker. Then one night, I happened to be up just before midnight (which is a rare occurance for me) and out in the galley getting some water when that annoying beeping started again. I looked all over to figure out what was going on and then it dawned on me. 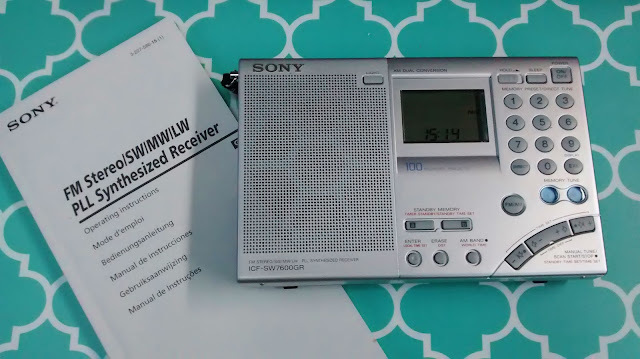 It was our SSB receiver. Yes, this thing. Looks like somebody thought it would be funny to program an alarm on it to go off at midnight. Every. Single. Night. My money's on that Nancy girl. She looks so sweet and innocent in her pearls and angora sweater set that wears in all of those photo shoots, but she isn't. She swears like a sailor and is constantly pulling pranks. It's a good thing her father is loaded, otherwise no one would be friends with her for very long. And she's a rubbish detective to top it all off. Well, anyway, I guess we can all celebrate. At least one mystery is solved - the Case of the Annoying Beep is now officially closed. And in completely unrelated news, hence the blog post title Other Random Nonsense, remember how I told you that another Moody 346 owner came to visit me a few days ago? 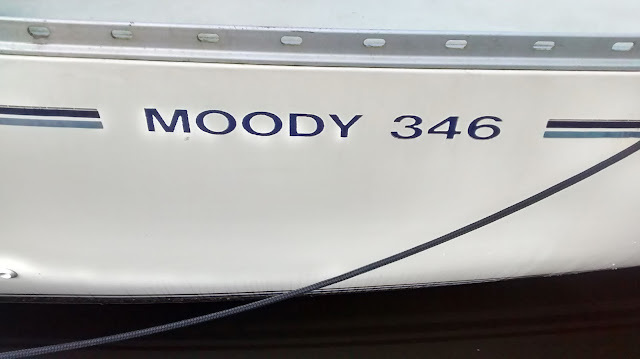 There were only 254 Moody 346 sailboats made between 1987 and 1990 and you normally don't find too many of them in North America. They're very popular in the UK and you'll see them in European waters, but it's pretty rare to spot one over in this neck of the woods. So, I find it kind of bizarre that there happens to be another Moody 346 stored long-term at Indiantown Marina. What are the chances? This one is the bilge keel version and, for all of you boat nerds out there, here's what that version looks like. I like the lettering on our boat better which probably gives you some insight into how shallow I am. If you're interested in what a Moody 346 looks like with a fin keel, or are just one of those people that enjoys reading boat specs, then you should have a look at our boat page here. And in the most random of nonsense, I had lunch with a friend at the Dairy Queen in Okeechobee today. I made the mistake of going online to see how many calories it was - over 900! I've seen Nancy at the drive through at Dairy Queen before picking up massive orders of fries and hot fudge sundaes. How in the world does she manage to stay so trim? I'm thinking there must be some liposuction going on. It's the only explanation I can think of. It's just a matter of time before she gets her own reality show. Oy vey. What kind of random nonsense has been happening in your life lately?